Tsujiri is located in the heart of Downtown Toronto and can be summed up as a matcha lover’s dream. The chain is 155 years old, starting as a Japanese tea brand from Kyoto. They finally opened their first North American store in Toronto (surprisingly the U.S. isn’t first for once). I had seen my fair share of Instagram posts of pretty green-coloured desserts so I definitely had to try it out. The store atmosphere was adorable and dainty. It was a small shop but the best part was the low traditional Japanese table at the back where you could sit on the tatami mat (shoes off of course). As expected, the menu entirely revolved around matcha: drinks, cakes, pastries, ice cream… anything you could think of. We tried 3 things to review: a matcha cookie, a latte, and yuzu matcha tea. Everything tasted pleasant. My matcha palette was not refined enough to distinguish between the good matcha and bad matcha, but the latte definitely surpasses Starbucks standards. It didn’t take too much to impress me. The matcha cookie was not much of a surprise. It was a puffy pastry with gooey (you guessed it) matcha ice cream inside. The drink that I really enjoyed was the yuzu tea: matcha tea with a slight lemon taste. It turns out the tea is made with yuja, a fruit similar to lemon. My only complaint? The prices. I wouldn’t drop by here on a regular basis but it is nice to treat yourself. The quantity you get is not justified by the price, but Tsujiri still gets points for being unique. My final thoughts? Definitely worth a visit; I mean, there aren’t that many matcha dedicated cafes in the GTA and the atmosphere along with the food is photogenic. Two months have passed since I flew back from Cancun, but I feel like I never left that wonderful land. Did my mind go crazy after midterms? Or am I so busy working with matrices that I’ve forgotten where I live? The truth is, I went to the Taco Fest this weekend! If you want to scroll down to have a brief look, hope your stomach doesn’t rumble in the library! And then there were tacos. This was one of the cheapest tacos, but still tasted delicious! Despite the strange-coloured onions, the whole taco was in line with Mexican street-style tacos. The corn tortilla was heated to burst rich and authentic corn flavour. It was thinner and rough, which resulted in a better texture. A mouthful of shredded chicken released enough juice, while jalapeño salsa and cilantro excited the taste buds from time to time. I also fell in love with this fried fish taco! Simple ingredients but much effort was shown in the marination. Normally fish has light flavour. The sour and spicy batter with sprinkle of herb gave this fillet a stronger taste to balance out the thicker and plainer bite of tortilla. Meanwhile, the original taste of fish stayed as the fillet was big enough. Here you can see more pictures of seafood tacos. There were mayo and coleslaw laid under both the jerk shrimps and lobster chunks. Personally, I would say that the coleslaw was more like salad that mixed two products into almost the same taste. Okay! All I want is more proteins on the taco next time! Congratulations! As a loyal reader of UWaffle blog, you can now see the most popular taco from last year. What! You don’t think this messy taco deserves the first prize? I thought so as well. But as I gave it a shot, I realized how satisfying it was to eat such a big fried chicken. Some details differentiated this taco with a fried chicken wrap. The coleslaw underneath was not dressed with mayo, which served some freshness in the right amount. What’s more, I love the beans and corns. Salted refried beans and corns are common side foods in Mexico. Here, the crispy fried batter was blended in with soft beans, and created a new eatery experience. I can’t introduce every taco I ate here, just like how I ran out of money and space to try all the tacos. I really appreciate the diversity that tacos possess. Pork belly, pineapple, mango curry, pull yam, etc., can all be found on the tacos in the Taco Fest. Crunchy bread, mango curry marinated chicken, pineapple pico de gallo, fried onion! We can always go beyond to create our own food combination. Once I ate burritos in Mexico. Bowls of guacamole, refried beans, caramel onions, jalapeño, and Mexican rice were served at the same time. It was like doing an experiment by mixing food instead of chemicals, and I think that was the moment I felt the spirit of freedom in Mexican food. Hope that my sharing will boost your creativity when you hold a taco night in the future! If you want to go to the Taco Fest next year… these are some final tips! Look at the menu on Instagram before you go. You may not have time to find the tacos you want the most, especially if you only have a short amount of time to spend. Seek for the most popular tacos before you line up for a random taco. You may get full quickly, so why not try something worthwhile? You need to pay for the entrance ticket first and buy food tickets after entrance. Each taco ticket costs you two dollars. Most tacos require 2 to 4 tickets. Therefore, the tacos are more expensive than those sold in fast food restaurants. If you are thinking of going restaurant hopping in Toronto, or just want to gain insight on some nice restaurants in general, you’ve come to the right page. 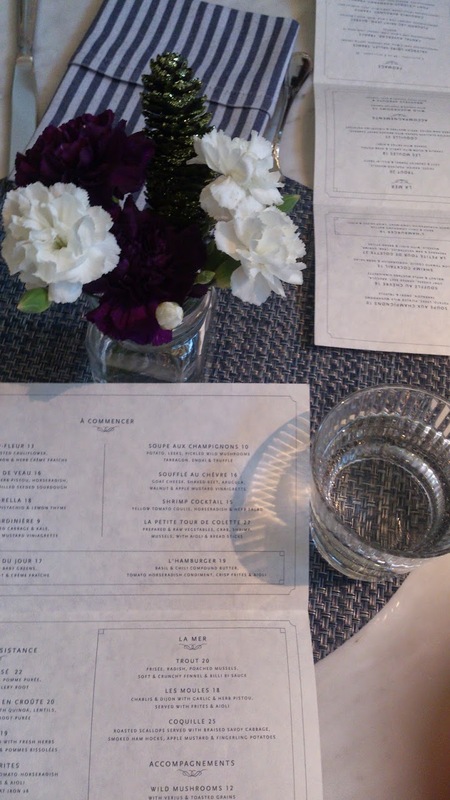 Let me introduce to you one of the chicest French Cafés in Toronto: Colette Grand Café. It is a restaurant located in Thompson Hotel at the corner of Bathurst and Wellington, with its own entrance on the east side of the hotel. 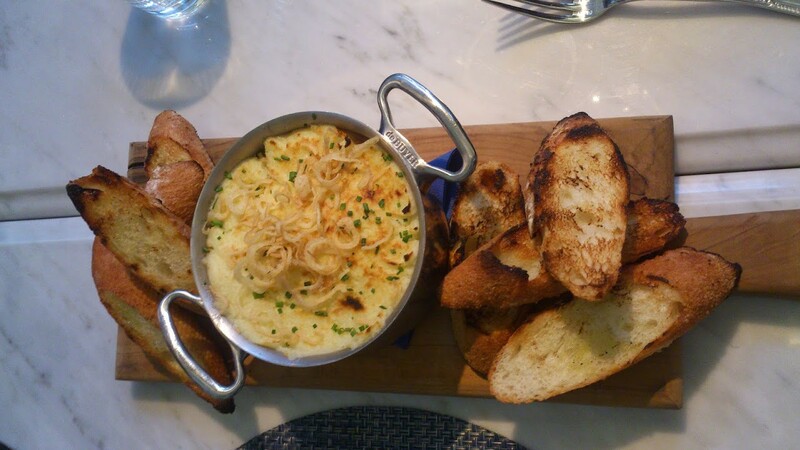 This café is an expansive French bistro with an outdoor terrace and multiple rooms serving delicious, classic dishes. As well, their menus get updated with new dishes every season! This is a restaurant which services its customers very well with great atmosphere, service, and food. 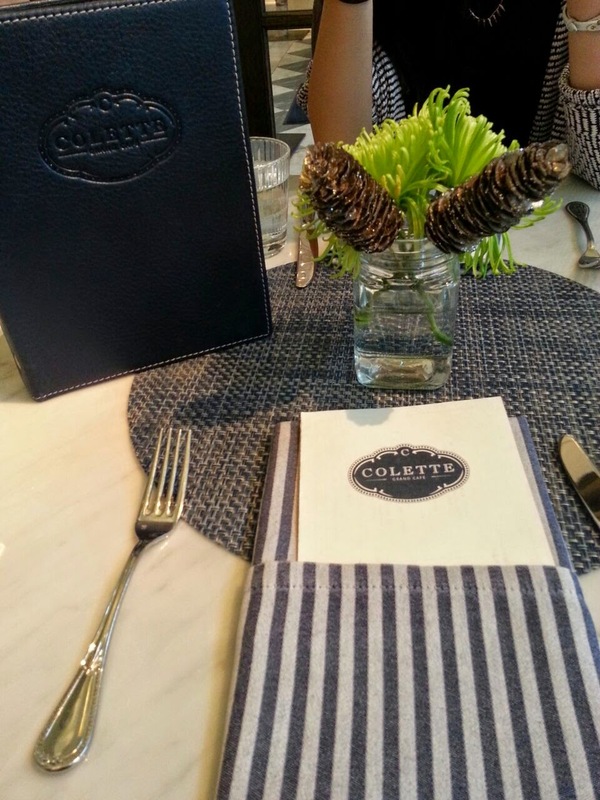 Upon entering Colette, I was immediately impressed by the exquisiteness of the décor and ambiance, which was much like a café straight out of Paris – classy, elegant, and stylish. View of the café from indoors. Take your pick, you can be seated at the tables or relax by the couches. Seriously, how cute is this place? Aside from the décor, another thing that made this restaurant stand out to me was the service. The waitress who served us was professional and attentive, without being intrusive. . She had a high degree of knowledge on the composition of the dishes, and was helpful in choosing our dishes with us. In the end, all four of us were sold on the same entrée: Beouf Braisé, which was braised beef short rib served with pomme purée, vichy carrots and celery roots. Shortly after we had input our orders, she returned to our table and informed us that, unfortunately, the restaurant did not have enough of that dish in supply to serve all of our orders. She explained that they still had one dish in supply, and offered to our table to share among our party, on the house. Although I was slightly disappointed, I liked how the restaurant handled this situation and was still glad in the end to be able to try the dish at the very least. Beouf braisé: braised beef shortrib, pomme purée, vichy carrots and celery roots. Served with warm garlic bread. This was the braised beef which was offered to our table free of charge. The taste was delicious and the flavours were inspiring. The braised beef had a nice taste and texture without it being too dry or heavy, and was topped off with mashed potatoes. Served on the side was garlic bread, which was warm and crispy. Overall, there was a nice balance of flavours to this dish and I would definitely eat this again in the near future. 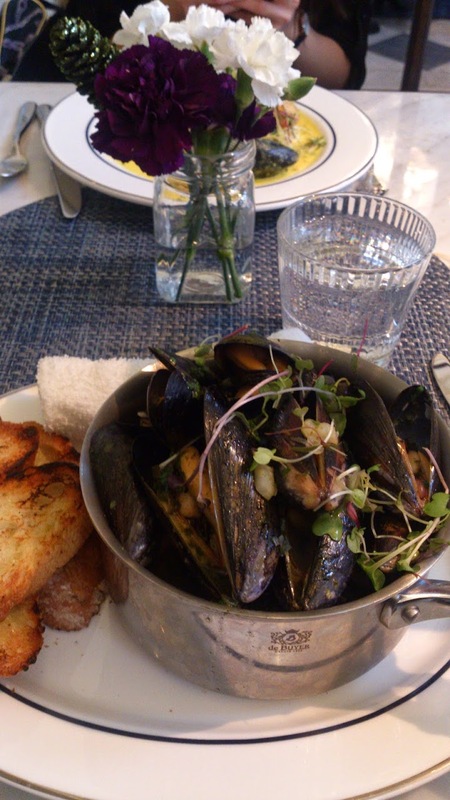 My actual entrée were the mussels – which were both photogenic and delicious. Les Moules: Chablis and Dijon with garlic and herbs pistou. Served with frites and aioli. The mussels were cleanly prepared to give a fresh taste, topped off with herbs which added a nice refreshing touch. Served on the side were warm and crispy frites, which were pretty standard, and my favourite garlic bread. The portion was a good amount as they didn’t cheap out on ingredients. Overall, it was a nice dish, but not anything too overly special about it. I would recommend trying other things on the menu, which are more unique to this restaurant. The price was a bit on the more expensive side, with the cost averaging around $20-$30 for an entree taken from the lunch menu. As well, I would recommend making reservations because it gets busy at certain times of the day.